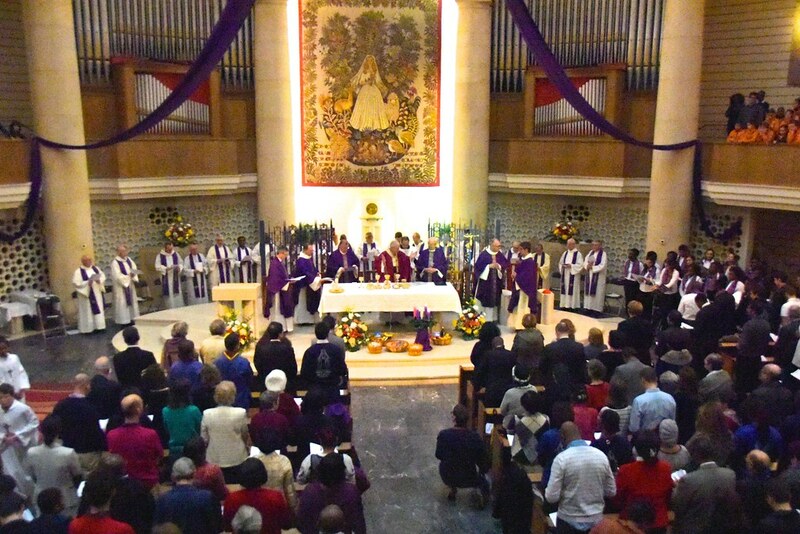 The parish of Notre Dame de France, the French church in Leicester Square, has rounded out a year of celebrations marking the 150th anniversary of its foundation with a Solemn Mass on Sunday 6 December. Cardinal Vincent was the principal celebrant along with the Marist priests, the order who founded and continue to have pastoral responsibility for the parish, and the Ethnic Chaplains responsible for some of the francophone congregations in the diocese. Fr Pascal Boidin, the Parish Priest, welcomed Cardinal Vincent, recalling that it was Cardinal Nicholas Wiseman who had asked the Marist Father Faure to found a new parish to serve the growing French population working in the Soho area. He said that it was Cardinal Vincent's presence to celebrate this significant anniversary with the French congregation was a sign of this continuity and a blessing for the parish. Among the concelebrants was Fr John Hannan, the Superior General of the Society of Mary, who delivered the homily. He began by recalling the terrorist attacks of 13 November in Paris in which 130 people were killed and 350 injured, explaining that the lesson for the followers of Christ is that 'no one is exempt from the personal responsibility of building a better world'. Paying tribute to the rich history of the French parish and the collaboration of laity, religious and priests, he acknowledged the great work of outreach done among the Francophone community in London as well as care of refugees and homeless people in the local community in the heart of Leicester Square. 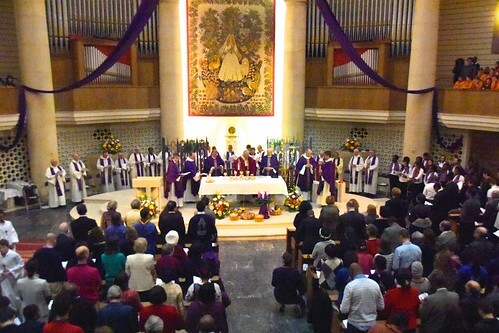 During the Mass, the traditions of the variety of francophone communities from different parts of the world were celebrated in the bidding prayers, which were read in several languages, the hymns from different traditions and languages, and the joyous offertory procession that included African members of the congregation dancing up the aisle with the gifts. After Communion, Timur D'Vatz, the artist who had recently completed a painting especially commissioned for this 150th anniversary, was called forward to receive a blessing by Cardinal Vincent. His painting depicts the Holy Family as refugees fleeing from Herod. It is a reminder of all the refugees who are today fleeing their homelands and a tribute to the work of the parish's refugee centre. The night of the 13th of November 2015, the city of Paris, and with it humanity as a whole was stricken by an evil act of aggression, a shameful event which resulted in the cruel death of 130 people and more than 350 wounded. It was carried out by deluded persons, probably indoctrinated by means of a distorted ideology. Since then, and indeed even beforehand, other ferocious atrocities have taken place in Africa and the Middle East. As the editorial of the La Croix newspaper said on November 15th "Since Friday, the terrorist threat in France has completely changed its proportions... Something that was hypothetical has become a terrible reality that can happen again tomorrow or the day after. We must therefore learn to live with this threat. The important word here is not "threat" but "to live”. We must not stop ourselves from living. We must not stop ourselves from acting, taking initiatives, rejoicing, and from loving. This will be our way of resisting the barbarity of Islamic terrorists." No one is exempt from the personal responsibility to build a better world, and that is precisely the message, around this event, which comes from our faith in Jesus Christ. From the Gospels, we know those things that are important, essentials in our daily lives, our relationships and in our actions towards our neighbours and those who need our support. As Christians we form part of the human community and so we are in solidarity with one another. As Christians our baptismal commitment sends us out towards others, not to impose ourselves upon them but to mutually accompany each other. There is no other way to fight evil and sin in our world. We are gathered here this morning to celebrate a magnificent venture, 150 years of religious collaboration with so many people of good will who have formed a Christian community here since the founding of the parish in 1865 until our times, first of all through our diocese of Westminster, through a committed lay people, religious and so many priests. Wandering through a brief history of the parish, I see that the mission has had its difficult moments for many reasons. Yet pastoral teams have responded to different needs as they arose: the francophone community in London and its surrounding areas, the many francophone education communities in need of catechesis, the multiple services to transient francophone people, various ecumenical initiatives, contacts with the marginalised: people who are refugees, homeless, the poor. Those accompanying couples preparing for marriage, and the other sacraments, and so many other things related to the daily life of a parish in the inner city. Today we wish to celebrate this success, we wish to thank God for the generosity and dedication of so many people in this ecclesial and multicultural centre. Following the example of the Apostle Paul in the first reading, our praise should focus on God who is without limit in his generosity to each one of us. All is grace! Bonhoeffer and Therese of Lisieux were of one mind that, "The only 'work' that counts now is to surrender to the cleansing and transforming power and the gratuitous love of God." In the words of Saint Paul today, and I quote, "I am quite certain that the One who began this good work in you will see that it is finished when the Day of Christ Jesus comes." (Phil 1 6). Today's Gospel is very striking in the context of the multicultural ministry of this parish in central London. This congregation is without doubt composed of people of many nationalities, but all are united in the name of Jesus Christ or through participation in its shared initiatives. In this sense we are responding to the call of John the Baptist who encourages us greatly at the end of today's Gospel by saying that "every living being shall see the salvation of God"
To understand the figure of John the Baptist is not easy for us "modern" women and men, imprisoned as we are by a ‘noisy’ civilisation, a multiplicity of messages, an intolerable chaos, and in a real sense, a huge amusement park of ephemeral things! John the Baptist, a robust and austere man in his very being, is an ideal companion to help us rediscover the true meaning of life. He is one of the most revered figures, after Jesus and Mary, in the collective imagination of the Christian community. Already from the beginning, John provokes conversation. He boldly proclaims to every woman and man that they need to 'repent' and to 'follow' the way of the Lord. But John is not driven by a personal impulse but rather because he has been touched by the "Word". He is sent. He is sent by God to prepare the Way of the Lord, Jesus Christ. He cries out because he sees the urgent need for a renewed life emerging out of the ‘chaotic desert' which was his world and which is also in a real sense, ours. The evangelist Luke, by repeating the words of the prophet Isaiah, presents to us the return of Israel from exile in Babylon with enthusiasm and energy. "Prepare the way of the Lord, make straight his paths, every valley shall be filled in, and every mountain and hill levelled; the crooked roads are made straight, rocky paths made smooth; and all flesh shall see the salvation of God "
There are so many mountains of pride and arrogance which resist and yet need to be flattened. There are so many valleys of hard-heartedness and indifference that must be straightened out. This is the way to prepare the Way of the Lord. The redemptive events initiated by Jean Baptiste, will attain their final goal when "Christ will come again." On behalf of the Society of Mary, I want to give thanks the Lord for all that you are doing in this sacred place and its environment. I wish to give thanks also for the work so well done down through the years, and I want to thank all of you, the faithful, for your loyalty and engagement in this parish through its many ministries and services. As a Marist I wish to thank God for the example and the presence of Mary, Mother of Christ, in our ministry here at Notre Dame de France. Through her, we try to live our faith, our commitment as disciples and at the same time draw benefit from her intercession with the Lord.